Add this shop to my favorites. Availability: in stock Condition : Very good, please study image carefully. Date : 1775 Overall size : 37 x 54.5 cm. Image size : 28.5 x 52.5 cm. 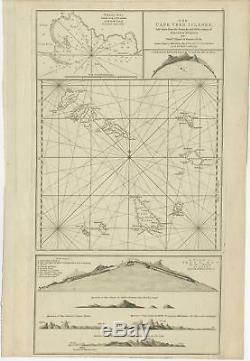 Description: Various maps and views on one plate titled'Praya Bay..' and'A view of Praya Bay.. Map and views of the Cape Verde islands, in the Atlantic Ocean west of Africa. Printed from two copper plates, published for Robert Sayer, London. The item "The Cape Verd Islands (.) Mannevillette (1775)" is in sale since Friday, September 21, 2018. This item is in the category "Antiques\Maps, Atlases & Globes\Africa Maps". The seller is "bartele-gallery" and is located in Langweer. Format: 37 x 54.5 cm.